A change in propulsion — to pods — is the first of many changes. When it comes time to develop a new yacht model that a builder hopes will be seen as an advancement, as something entirely new, what does that builder do? It can change the design and layout. It can rethink its reliance on traditional propulsion methods. It can increase functionality. It can create a new space in which its new yacht is built. It can build the new yacht out of a previously unknown substance extracted from below the surface of a distant star. Ocean Alexander did all but one of those things with its new 70 Evolution. (We’ll let you figure out which one it didn’t do.) The Taiwanese-based builder decided to manufacture the 70E in the United States, and it expressed a commitment to U.S. production by fitting out a state-of-the-art boatbuilding facility in Merritt Island, Fla. Now, this isn’t the first Ocean Alexander to be built stateside — its 120 was built in the U.S. at the Christensen Yachts yard in Vancouver, Wash. — but the Evolution line is up to hull #4 in production (hulls five through 10 are sold and ordered) and they’re all being built in Florida, so there’s definitely a progression in thinking at OA. And since doing the entire yacht justice in this space is impossible, we’re going to concentrate on what stands out as evolved. One thing the OA designers wanted to ensure is that the 70E can be operated by a couple, and to do that they looked at something completely new for the builder: pod drives, which themselves led to an evolution in propulsion when Volvo Penta introduced them just more than a decade ago. Yes, couples have managed to operate and dock yachts of this size with traditional drives for many years, but if you’re a yacht builder and you can make that experience easier, you do it. Volvo Penta’s IPS pod drives are hooked up to twin Volvo IPS 1200 diesel engines, each delivering 900 hp. Tight slips, current and wind aren’t nearly the issues they used to be for a boat operator with a joystick control who can walk his 70-foot yacht sideways. Add the electric bow thruster, and precision movements are easily manipulated by experienced or novice boaters. 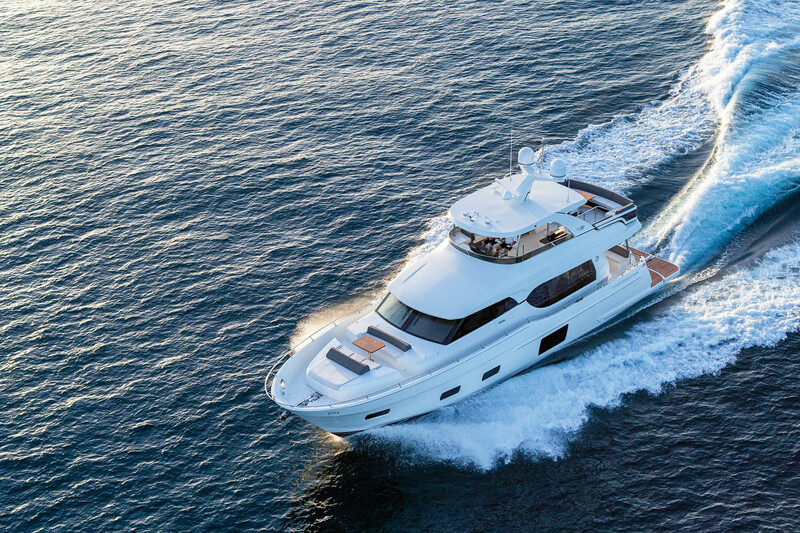 The combination of pods and the thruster puts the 70E well within a first-time boat buyer’s comfort zone, which might not seem like the demographic for a builder whose smallest yacht is this 70-footer, but times have changed. Chalk one up for technology and its intelligent integration by yacht builders. The evolution of the 70E isn’t limited to the areas that are out of sight. In fact, most of the changes are in plain view, beginning with the bow and stern. As someone who grew up in the 1980s, I must admit to knowing that a mullet haircut is “business in front and party in the back” (though I will neither confirm nor deny I had such a ’do). The 70E turns that around, moving the party to the front and putting the business to the stern. Not simply a place for a sunpad, the bow is a full-on entertainment spot. Twin settees face each other across a table, providing room for six people to sit comfortably, and there is still a sunpad forward of all that. Twelve cupholders ensure everyone’s drink has a secure home. And for pasty-skinned folks such as myself, an overhead canopy can be erected to cover the area. It’s sturdy enough to withstand the elements at top speed, which on test day was just shy of 30 mph. At the opposite end from the bash-worthy bow is what we’ll call the business end of the yacht. It’s a teak-covered expanse of swim step that could host its own party. So why is that the business end, you ask? Well, the aft half (maybe a little more) of the swim platform is a hydraulic lift that lowers into the water and includes a built-in cradle for the dinghy, so it can take care of the business of launching and retrieval. 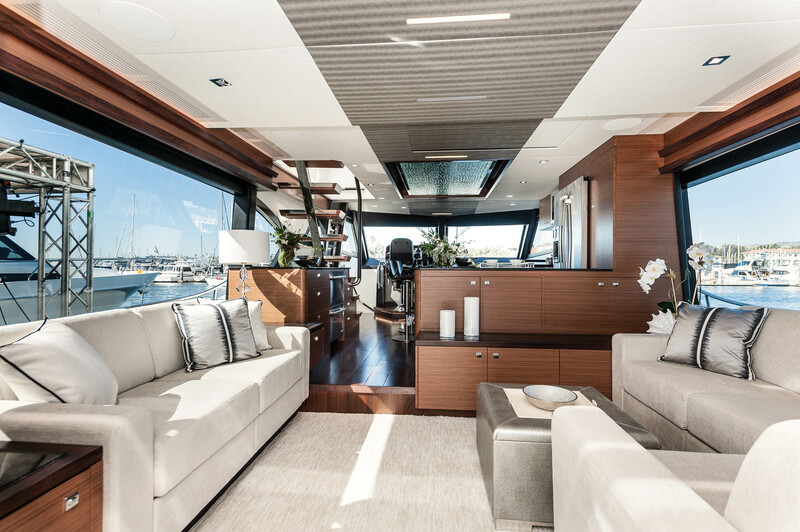 It also creates room for a rather large social space on the flybridge, which we’ll get to. But with the dinghy released and tied off, the platform can serve as a submerged beach. Maybe one can mix business with pleasure. 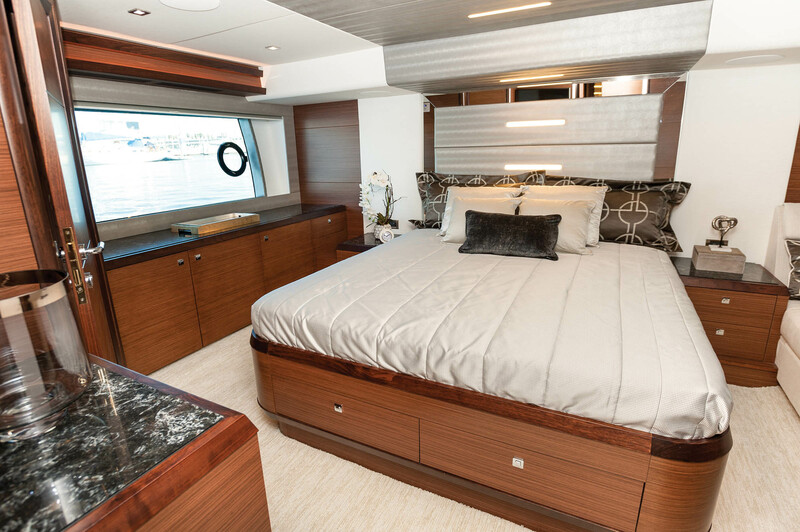 If there was one thing observers could count on in the main cabin of an Ocean Alexander yacht, it was a bulkhead separating the salon from the galley and the dining or helm area, but the 70E is different. From the entry door aft to the helm forward, the interior is a free-flowing, three-level great room (only one step separates each “level”). The layout itself is similar to other OA models — salon aft, galley amidships, helm and dining area forward — but the elimination of the bulkhead between the salon and the galley makes all the difference, making it possible for the captain, chef and lounging passengers to participate in the same conversation. 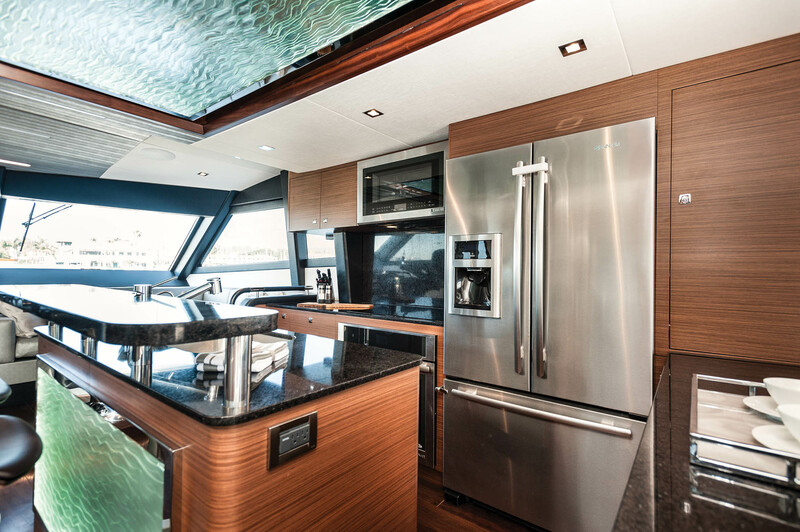 With the glass door open, even people on the aft deck can be part of the action. In the salon — love seat to port, L-shaped settee to starboard — the window bottoms have been dropped a few inches to increase their size, and the air vents have been reconfigured so as not to protrude from the ceiling and cut into the view. A 50-inch TV drops out of the ceiling. Full-size stainless appliances (Jenn Air, Whirlpool and Bosch), satin wood cabinets and high-end stone countertops define the pass-through galley, which is L-shaped with an island that has a bar-height section and twin barstools. 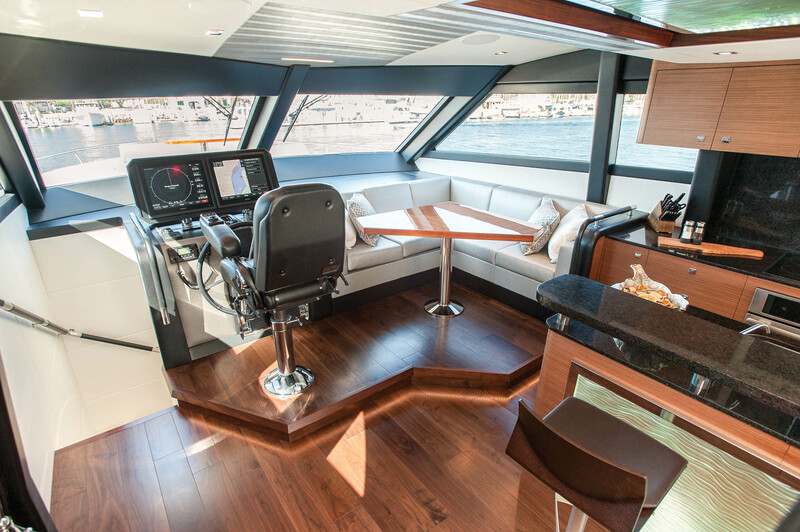 Forward of the galley is the just-port-of-center helm and a corner settee with a table. 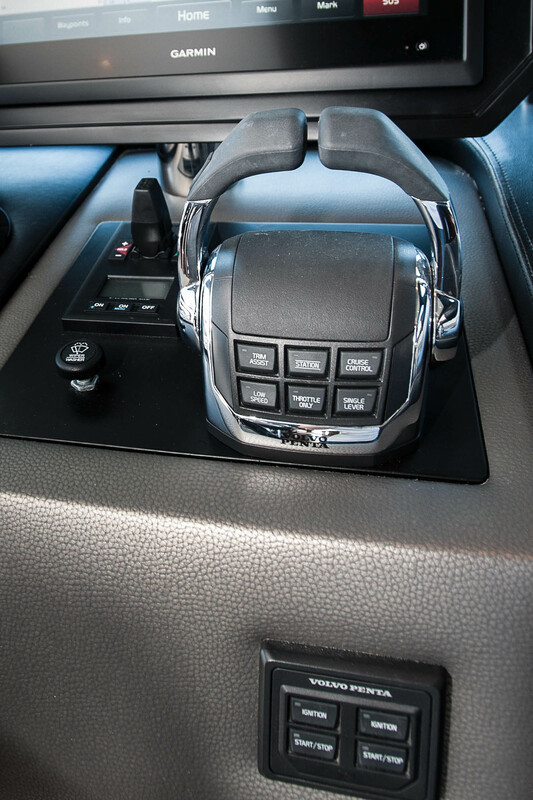 The helm’s signature feature is a floating pod that houses two 19-inch Garmin touchscreen MFDs. 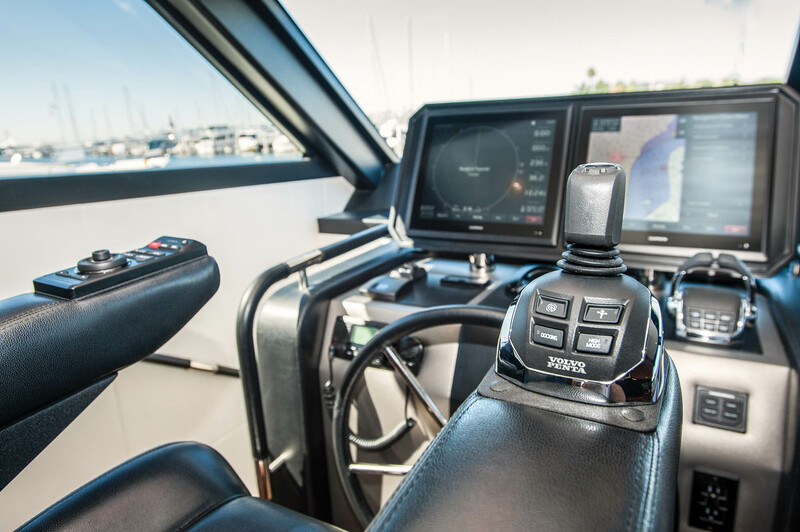 The other signature feature (don’t overthink it), at least on our test boat, was the Stidd captain’s chair — more specifically its arms, the right one being home to the IPS joystick while the left was home to the Garmin GRID remote control, which operates the MFDs. The captain will think he’s piloting a spaceship from the Kirk Chair. It’s all part of the evolution. Jerry Wheeler and Russ Butera, of the Alexander Marine California office, and I watched the Garmin MFD as the speed reading reached 29.5 mph on a calm ocean. Almost 30 mph in a 70-footer with twin Volvo Penta IPS 1200 diesels that crank out 900 hp apiece. That’s a positive testament to a hull design meant to take advantage of the pods by emphasizing its planing ability. The twin Volvos were burning a combined 87 gph at that speed, for a range of about 330 miles. Slowing the 70E down to 1000 rpm, 10.8 mph, yielded a fuel burn of 10 gph and a range of just about 1,000 miles (with a reserve). At 23.5 mph (2000 rpm), a fast cruise speed, fuel burn was 63 gph, for a range of about 350 miles. Range is closer to 400 miles at 1750 rpm and 18.4 mph, with a 45-gph fuel burn. Driving the yacht, hull #2, was a lot of fun thanks to the joystick in the arm of the chair. No longer just a slow-speed mechanism, the joystick steers the boat at all speeds. Twisting it delivers micro-movements more apropos to docking, while pushing the stick to the left or right delivers instant turning, serving as a precise, videogame-like steering wheel. 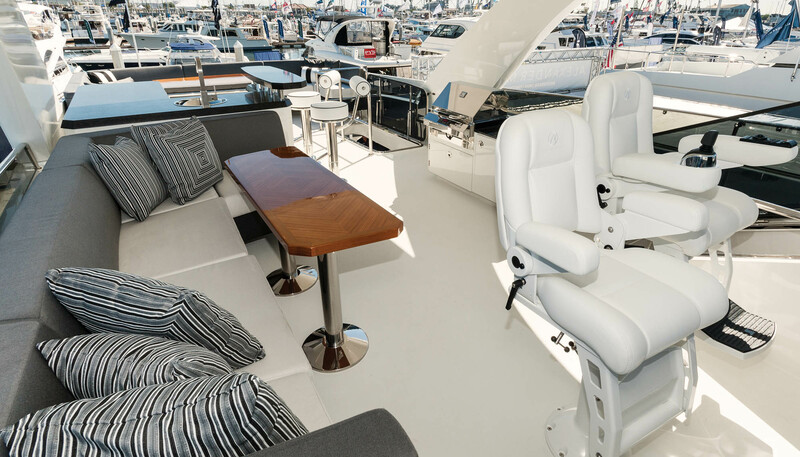 Mimicking the lower helm, the flybridge station features a floating pod, controls in the arms of the captain’s chair and the same instrumentation. We conducted the sea trial from the topside helm, and there was plenty of room for the two non-drivers at any given moment to sit, whether in the companion captain’s chair, on the L-shaped settee for six to port, on the two barstools or on the 10-person settee all the way aft. It’s that settee that occupies the space created by putting the dinghy on the hydraulic swim platform. 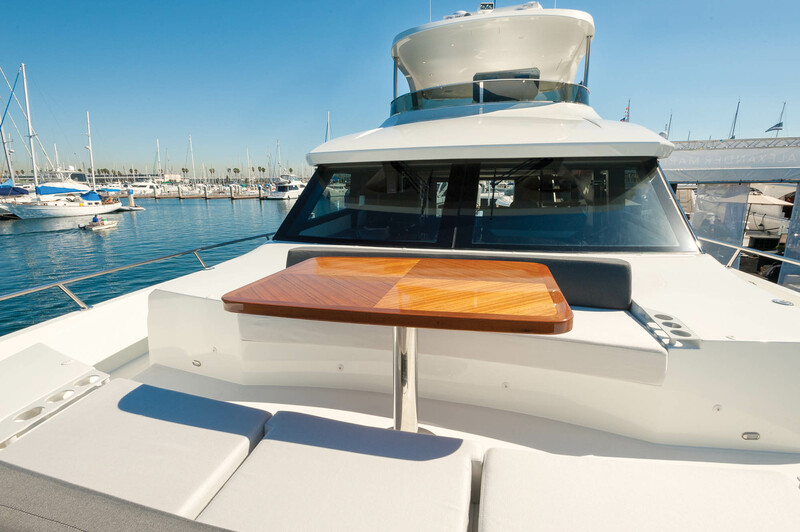 Filler cushions turn it into a sunpad, as the hardtop stops just forward of it, at the aft end of the wet bar. An electric grill sits to port. Eight people can sleep comfortably belowdecks in four staterooms: the VIP forward, side-by-side twin berths to starboard, bunks to port and a full-beam master amidships. The VIP has an en suite head, while the other two guest rooms share a third head, though the starboard room has direct access. Ownership has its privileges, and on the 70E, those include the master stateroom. A king-size bed dominates the center of the room. To starboard is a built-in bureau that’s longer than the bed, and to port is a chaise lounge, the foot of which serves as a seat for the built-in vanity. I sat in the chaise for a moment during the sea trial, watching the water fly by in the large hull window and listening to the low drone of the engines — napping and reading will be popular here. The master head is an opulent space with stone counters and floors, HansGrohe faucets, and a Planus toilet system. While the 70E is the smallest yacht in the Ocean Alexander lineup, it nevertheless provided plenty of room for OA’s designers to deliver a spate of changes and advancements, from nuanced to game-changing. The DNA is still decidedly Ocean Alexander, and the final product is an evolved version of a long-range couples cruiser with style and flair in the right places. LOA 70 ft., 6 in. Beam 18 ft., 2 in. Volvo Penta IPS 1200 diesels, Garmin 8500 series black box with two 22-inch screens at both helms, Garmin GRID remote input at both helms, CZone monitoring systems, high-end galley appliances and much more. Volvo IPS Dynamic Positioning, Northern Lights 20 kw genset, electric bow thruster, hydraulic stabilizers, 450 gpd water-maker and more. This entry was posted in Boat Tests, Featured and tagged Ocean Alexander, Ocean Alexander 70 Evolution by bsheehy. Bookmark the permalink.